Before moving to Australia, I transferred money from my USD account to my AUD account over several months and I did this over several months (actually years). Why did I transfer money over several months and not just a single transaction? Well the answer is simple – I wanted to average out market volatility. 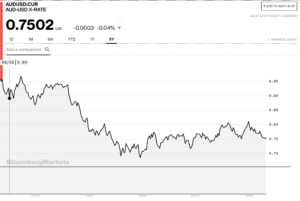 As you can see from the AUD vs USD exchange rate graph below that exchange rate has been highly volatile and I would have been kicking myself if I say did all the transfer in a single transaction in 2014 instead of multiple ones over several years. I tried several different options when transferring money to Australia. In this post, I’m going the discuss the absolute best one. I found that the Exchange Rate offered by TransferWise is much higher (probably the highest) – even higher than Xoom. At the end, after all the fees, what matters to an individual is the net amount they’re going to receive. With TransferWise, I found that to be the case most of the time if not every single time! Unlike other platforms like Xoom, wire transfer options etc, I found that TransferWise exchange rates are dynamic and they keep changing throughout the day. So, you’re at an advantage to take advantage of any significant event. For example, today the news from Italy added 10 cents to the exchange rate, so I was able to take advantage of that. During the entire day, the wire transfer and Xoom rates did not change a bit. Unlike Xoom or other transfer options, I did not observe any cap limits on the number of transfers, total amount of transfers within a certain period etc, which was great. TransferWise zooms past Xoom and others in all the aspects. Even though they charge a fee but the net amount received by recipient would be higher than all other options, which show as if they do not charge a fee. TransferWise is straightforward and transparent about their exchange rates and fees, which also helps. When compared to Xoom, TransferWise takes longer for the money to get transferred to the recipient’s account. So, if you’re not in a hurry (and we’re talking about a few hours), then TransferWise is the best option for you. These three should be good enough reasons for anyone looking to transfer money to Australia to use TransferWise. Use this referral link to get your first transfer for free (transfer up to £500 is free).